Once I finally decided to take wheat out of my little man’s diet I knew just what I needed to do, head to the book store!. I sat there for a good twenty minutes flipping through two allergy-free cookbooks, both written by well-known allergy-friendly authors. So what did I do? I bought them both. I have SUCH a hard time making choices…ugh. I decided to make the blueberry muffins from Learning to Bake Allergen-Free by Colette Martin and they did not dissapoint. 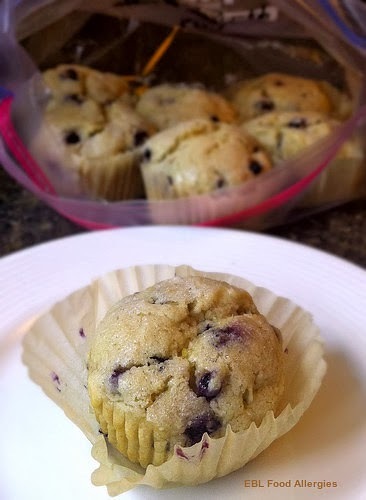 I recently had the pleasure of meeting Colette at the Food Allergy Bloggers Conference and was able to tell her in person how much I love this blueberry muffin recipe. 🙂 She is a very kind person and was eager to hear what I thought. Thank you, Colette! The muffins were moist without being heavy. The texture was fantastic too! Most important, my son devoured them!!! I kept four out and froze the rest in sealing freezer bags. Using a permanent marker I wrote which recipe the bag contained, the date, and a big Y meaning they were safe for my son to eat. I LOVE filling my freezer with allergy-free foods. It’s such a wonderful feeling opening that freezer and seeing all of the freezer bags full of SAFE food for my son. The first recipe made from Learning to Bake Allergen-Free was a success. I look forward to trying more with what I’m hoping will be similar results. Do you have a Kindle? The Kindle version of this cookbook is only $2.51 or you can buy the paperback from Amazon for $13.85 new. Personally, I think it’s worth the extra money to have an actual book in my hands. Do you have Colette Martin’s Learning to Bake Allergen-Free? What recipes have you tried? I’m trying to decide which one to make next! !